Few things in nature signify more promise for the future than a bird’s nest full of eggs. As their embryonic lives progress, you begin to see small cracks in their shells, and finally young chicks emerge. A new generation is born. I’m fortunate to live in an area where it’s relatively easy to find bird’s nests built around the limbs of Palo Verde trees or hidden in the prickly arms of a Cholla cactus. 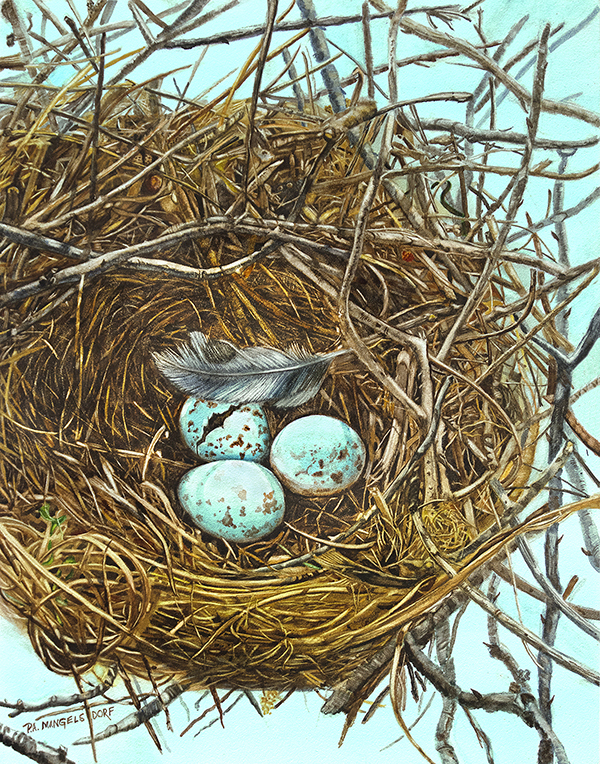 These nests inspired me to create the painting below entitled “Spring Break”. If you look carefully, you’ll see a small “break” in one of the eggs that will soon produce a new chick. 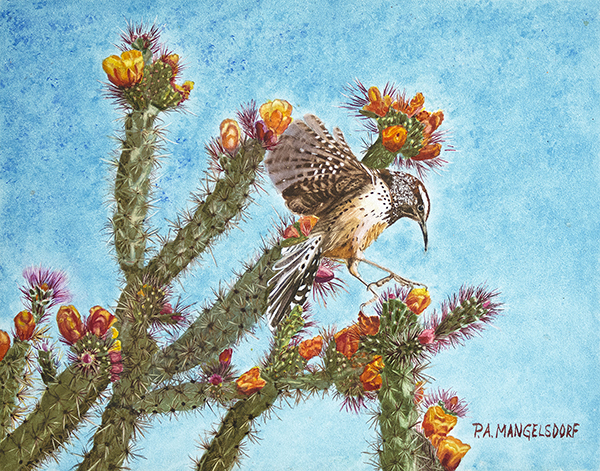 And, speaking of Cholla cactus, my second new painting entitled “Cactus Wren in Cholla”, shows the state bird of Arizona coming in for a landing. Its blurred wings tend to illustrate just how careful he must be to avoid becoming impaled on the sharp spines of the cactus…somehow they always seem to avoid that disaster. Summer has recently incinerated the southwest desert, and as I write this, the temperature is edging toward 118-degrees! It’s a good time to stay cool indoors and work on new paintings, so be sure to check back soon to see what’s new. This entry was posted in New Works. Wonderful, Pam!! Stay cool….can’t wait to see your next paintings…..wonderful detail!! motion, is beautifully executed! You are advancing with your technique by leaps and bounds! Sorry it took me so long——–this was the week for Bolero’s surgery and tooth cleaning. heart, he just doesn’t understand!